One of the most exciting and challenging aspects of being a dad is leading family worship. Fathers have the duty and privilege to train their children in the fear of the Lord, and the best way to do this is little-by-little, consistently over time. 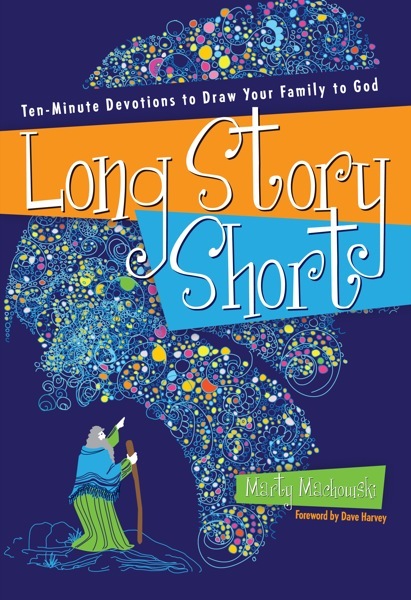 To help with this task is the new book Long Story Short: Ten Minute Devotions to Draw Your Family to God. The current volume covers the Old Testament. The New Testament volume is still forthcoming. It is simple. You don’t need an hour every night. All you need is ten minutes, five times a week--fifty minutes a week. Furthermore, all that is needed for dad to prepare is a simple read through--at most five minutes. That makes discipling your children not feel like such an impossible undertaking. You can let the Word of God transform your children’s lives with only fifty minutes a week. It spans age ranges. The author explains in the introduction how with some tweaking the material can target children from four to teenagers, and also how to use the material when you have a combination of ages and maturities. It is creative. Every week begins with a creative activity or object lesson to introduce the week’s topic. Almost every day contains an illustration to help the kids understand. It is systematic and comprehensive. The entire curriculum for both Old and New Testaments will take a family three years to complete. The topics and stories are intentionally chosen to give your child a comprehensive knowledge of the Bible. Once you have finished the three years, then it is time to start over again since about every three years your child reaches a new developmental stage. They will be able to think about the stories and questions in a way that is different and more complex than in the previous cycle. A man-centered gospel is always threatening to supplant the cross-centered gospel we read in the Bible. But if we trade Jesus, who bore our sins and received the wrath of God, for a Jesus who is merely a good example, we don’t have the same gospel. If we remove a call to repentance and replace it with an invitation to be God’s friend, we’re not passing on the treasure of the gospel in accordance with the Scriptures (p. 1). So, you can trust this resource for both Bible knowledge and Gospel-centrality. It gets children to use their Bibles. This is not a Bible storybook. Bible storybooks have their place, but this is a book to be used alongside your Bible. Children will turn to and read directly from the Bible rather than just being told about what the Bible says. It is not based in a particular translation. When quoting from Scripture the book uses the ESV and NIV, but the questions and answers are not bound by the words of a particular translation. So, you are free to use whatever translation your family chooses. In my opinion, it is best to use a single translation throughout a child’s life rather than using a “simpler” translation like the NIV or NLT when children are young, and then graduating children to a more literal translation like the NKJV or ESV. Gone are the days when all English speakers read, know, and quote from the same translation. However, in your home, it is good to be consistent, and thereby plant the words of Scripture firmly in the minds of children. Children will passively memorize Scripture through repetition, just like many of us who grew up in Christian homes can almost quote verbatim passages from the KJV that we have never tried to memorize. Therefore, I think it best to stick with one translation throughout a child’s life, and I think a literal translation is best. We use the ESV in our home, and this resource allows for that choice. Jude is still too young to use this book yet, but we are looking forward to the time when we can give it a real test-drive. However, those of you with children a little older should go ahead and check it out. God will bless you as you are faithful to teach your children the words of Scripture and bring them before the throne of God in prayer.